Its extreme...Its Extreme...ITS EXTREME...OOHHRRRGGG ITS EXTREME! It’s the Thermaltake Armor Case Extreme Edition! Building off of the already sick Armor platform, the Armor Extreme takes the super-tower to a whole new level. Massive cooling in this case is provided dual 120mm and dual 90mm cooling fans. 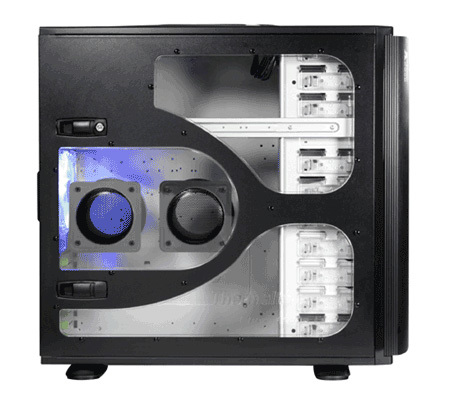 Abundant ventilation is apparent throughout the case, and also sports dual adjustable CPU air ducts. This is the kind of airflow that scores most righteously with overclockers, watercoolers, extreme performance gurus, server-ites, and workstation graphics pimps alike. In fact, AMD gave this case four thumbs up (apparently they are some sort of mutants) and recommended it for their Quad FX Platform...groovy! The Armor Extreme boasts a fully modular flexibility with 11 flexible drive bays, and 7 expansions slots. The power and reset switch panel can be relocated into any drive bay to suit your preference, and retractable foot stands allow for stability or fitment...choose your destiny. Have a sardine sandwich or something you want to keep handy just in case? The included iBox drive bay storage compartment can be located in any 5.25" drive bay you want. So if you want your computer to go extreme...Extreme...EXTREME...then you are straight up required to house it in the Armor Case Extreme Edition from Thermaltake!